The U.S. Federal Communications Commission and the CTIA, a lobbying group for the wireless industry, discussed a major initiative last year that could have significantly cracked down on trading in stolen phones, but the plan appears to have gone nowhere. A draft of the initiative, called STOPS, describes it as "a multi-stakeholder initiative" intended to "stamp out the illegal secondary market for smartphones and other mobile devices." The document, dated Aug. 15, 2013, was obtained by IDG News Service through a public records request. 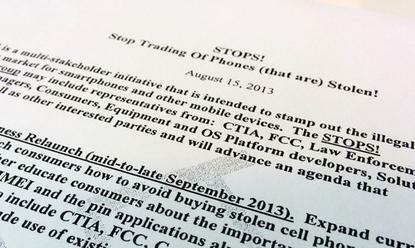 STOPS was due to begin last September with a campaign to teach consumers how to avoid buying a stolen phone. That was to be followed in November with the promotion of software that could remotely wipe lost or stolen handsets and display a "stolen phone" message on the screen. Perhaps the biggest step was to happen last month, when third parties and law enforcement would be able to run a phone's unique IMEI identification number against a database of phones operated by wireless carriers. Another system would act as a kind of Carfax service for phones, allowing people to verify a used phone hadn't been flagged as stolen. The plan was to conclude later this year with a one-stop website where "all the necessary reports" could be filed when a phone is stolen. Today, eight months after the document was drafted and seven months after the program was due to get underway, it appears to have gone nowhere. A spokesman for the FCC wouldn't comment on the record about the STOPS document or answer specific questions on the status of the plan. "Commission staff is in regular contact with carriers and law enforcement about this important area of concern and STOPS is part of that process, which is ongoing," the spokesman said. The CTIA didn't return a request for comment. During the same period, pressure has been building on the industry to do something about the growing problem of violent smartphone theft. Wireless carriers and phone makers have mostly dragged their feet, although the threat of legislation on the horizon appears to have them moving. For example, the CTIA long opposed the installation of "kill-switch" software on phones but changed its stance ahead of a recent California Senate vote on a mandated kill switch. The California law, SB962, passed the state Senate last week and is now in the hands of the assembly. If it passes, it will require a software kill-switch on all phones sold and manufactured in California from July next year. The bill has received backing from law enforcement officials across the state including San Francisco District Attorney George Gascon, who was asked for his reaction to the STOPS draft plan discussed by the FCC and CTIA. "These are steps that can be taken right now to undermine the black market for stolen devices while more effective technological solutions make their way to market," he said.